William Morrow Paperbacks, 9780062026880, 336pp. Nicole Galland, author of The Fool’s Tale, turns her clever pen toward re-imagining the famous legend of Lady Godiva in this expertly crafted historical novel set in Anglo-Saxon England. 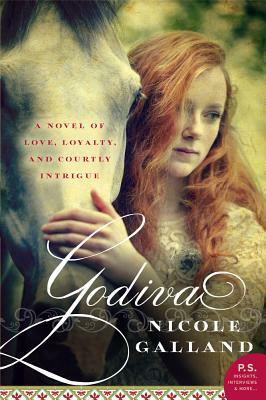 Told with humor and precise attention to detail, Nicole Galland’s Godiva brings to life the adventures of the legendary lady, her husband and her best friend the Abbess Egdiva in thrilling detail. It’s an entertaining tale of courtly intrigue, deceit, and romance that is sure to captivate fans of literary and historical fiction. Nicole Galland's five previous novels are The Fool's Tale; Revenge of the Rose; Crossed; I, Iago, and Godiva. She writes a cheeky etiquette column for the Martha's Vineyard Times. She is married to actor Billy Meleady and owns Leuco, a dog of splendid qualities. — Peter Sagal, host of NPR's Wait Wait...Don't Tell Me!